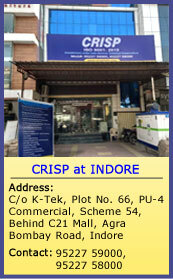 CRISP, Bhopal is engaged in delivering IT solutions related services to State Government Departments. CRISP is looking for capable and competent Agencies for Re-appraisal of CMMi DEV ML3V1.3 certification. Interested Companies/Firms/Agencies can submit their proposals against this EOI all other documents complete in all respects by 30thOctober, 2017 upto 03:00 PM at CRISP, Shyamla Hills, Bhopal. Details with respect to the EOI are available on CRISP website www.crispindia.com. CEO, CRISP reserves the right to accept or reject any EOI or all EOIs without giving any reason.